"This is so important, it’s so historic," Taylor told the audience. "I'm so proud to be here with you tonight. Fellow democrats even a few republicans who see that they can’t go that way that can’t do that thing. Not this time." Hours earlier, one New Hampshire Republican—former US Senator Gordon Humphrey—announced he’ll be voting for Clinton, and implored other Republicans to do the same. A message of unity, and inclusiveness was the big message of the night. "I want to be be the president for all Americans, those who vote for me, and those who do not vote for me," Clinton spoke. "Because we have to heal this country. And that’s gonna take everyone!" 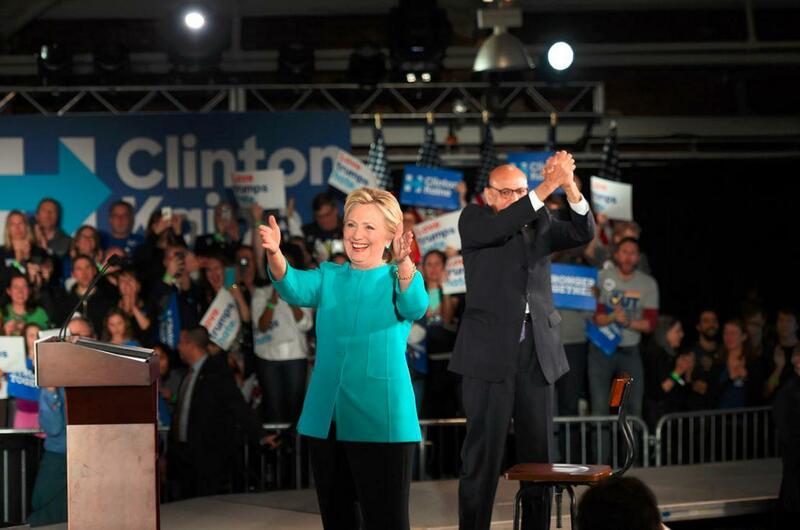 Clinton came on stage with Khizr Khan—whose son was killed in Iraq, and who led a call and response with the crowd. A few people held up constitutions while Mr. Kahn spoke—calling back to his speech at the Democratic National Convention. Others held up printed copies of Clinton’s agenda—as Clinton took one more trip through those promises: Affordable pre-k, bringing technical ed back into high schools, paid famiy leave, equal pay for women, supporting family business, debt free college. She told the crowd she expects New Hampshire to hold her accountable to those promises, if they elect her. "We’ve got to get everyone to believe that this election is about you. It is about you, your dreams, your aspirations, your hopes, your family, your community. I have never felt more strongly about what we can do together. I am confident, and I am optimistic about the future we can make together." 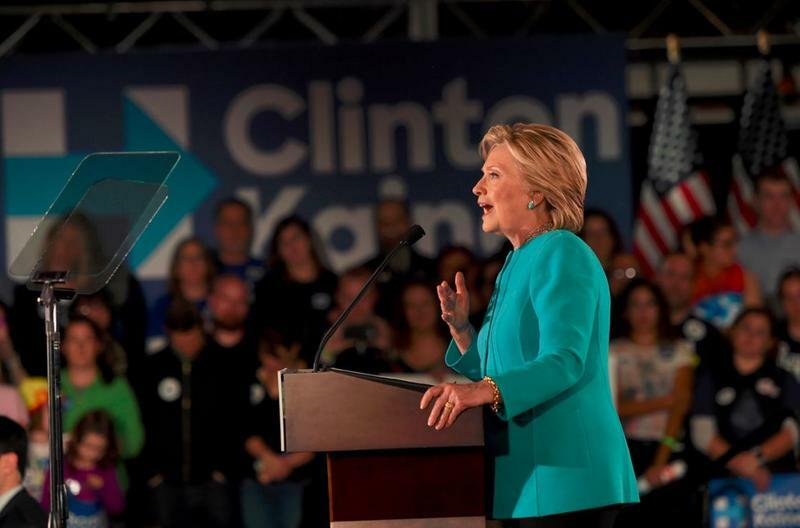 Clinton pledged to bring healing, and reconciliation to the state and to the country, and that she hoped to get going on that as soon as November 9. Chelsea Clinton is campaigning for her mother, Hillary Clinton, in New Hampshire on Friday. She'll make stops at Keene State and Dartmouth College, just the latest in a series of college campus visits for the Clinton campaign in the state. 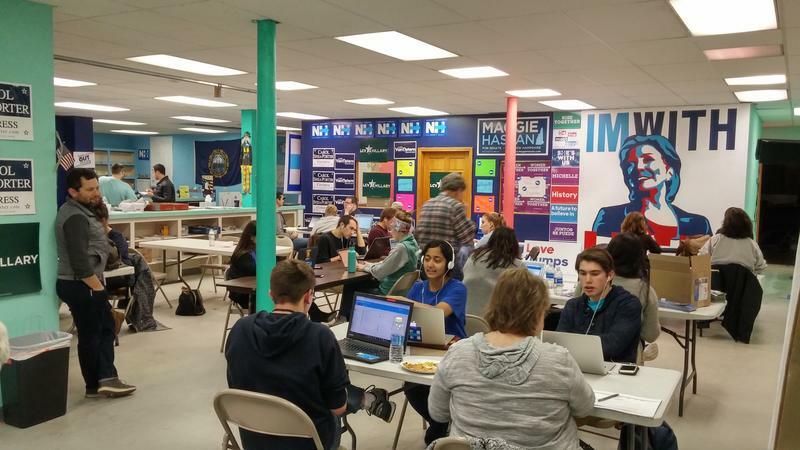 The youth could mean a boost for Clinton in the New Hampshire polls -- but only if college-aged voters bother to cast their ballot.